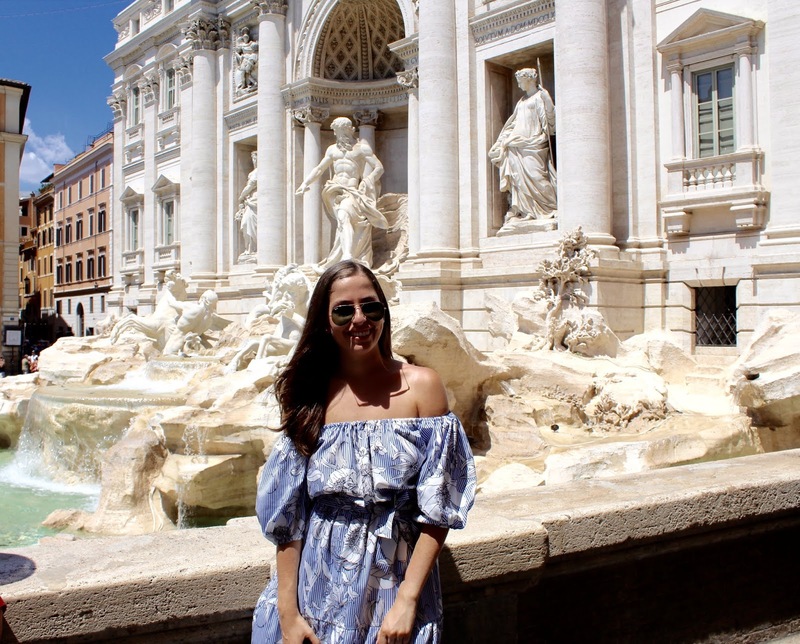 This is the first blog post of three, documenting my family vacation to ITALY! On July 19, 16 of the closest members of my family: my three brothers, sister, parents and all my nieces and nephews and in-laws, and I took a 4:30 pm flight out of JFK for our family vacation to Italy!!! I sported my J Crew linen chambray culottes (similar) with my J Crew white t-shirt to keep me comfy on the seven-hour flight. They were perfect for the early morning landing in Rome and then my full day of adventures. I also carried my Longchamp Le Pliage large tote, with a J Crew neckerchief tied around the handle, as my carry-on but also my bag during the trip! It fit my huge Camelbak water bottle as well as my DSLR camera when I didn't want to carry it over my shoulder! We barely slept on the plane, which is typical, despite having no one next to me in the middle seat. We had a short drive to our hotel, Hotel Lunetta, from the airport. 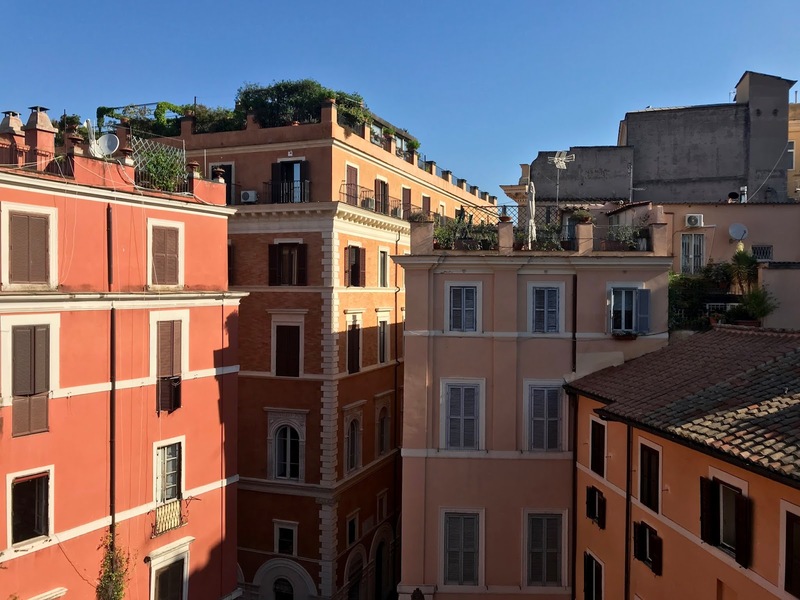 Hotel Lunetta is a small and old hotel in the heart of Rome. It was small but gorgeous! After all what do you need your hotel for, other than to shower, use the bathroom and sleep? The location of the hotel was great! We were able to walk everywhere! When we checked into the hotel, we ate breakfast, walked around a bit, napped for an hour, and then went to the catacombs of Rome!!! We learned that back in the day, no bodies were allowed to be buried in Rome, so we took a short, 10-minute bus ride with our amazing tour guide, Marco from City Wonders, to the catacombs. City Wonders was great! Marco was so smart and gave a very long but informative tour. We got to see bones and the catacombs, and it was a nice (slightly spooky) way to start the trip! We were not allowed to take pictures inside of the catacombs because it is a sacred space. While on the way back into the city, our tour bus had a bit of an accident. The driver made too close of a turn and the window I was sitting at shattered when it crashed into a street sign. Thankfully, there were two layers of glass on the window, so the glass didn’t get on us. We calmed down a bit, when had our chocolate gelato, the first of many for the trip! We ended our first day of the trip with a big family dinner, party of 16, at Cantina Lucifero, very close to our hotel. We munched on cured meats, bread, pasta and washed it all down with wine, limoncello and desert. Our first dinner in Rome was a success and it was a really nice way to start our crazy family vacation on a very high note! On our second day in Rome, July 21st, we had an early wake up call to go to the Vatican and meet the pope! But really! The Vatican was something special! We waited on line for 45 minutes to get into the Vatican even though we had a private tour with a guide, which was kind of annoying. We did pay for the “fast pass” after all. It was super-hot in the museum leading up to the Sistine chapel. There were too many people and I couldn't really enjoy the artwork. Unfortunately, I was kind of underwhelmed by the Sistine Chapel. The ceiling is magnificent and hard to describe in words. The Sistine Chapel is deemed one of the holiest places for Catholics. I wanted it to feel like the holy place it is and I wanted to feel something really amazing inside of me but that did not happen. The Sistine Chapel felt like a museum with all the talking and the tourists. St. Peter’s Basilica was also amazing but yet again underwhelming despite the size of it. This is where the Pope holds mass and can fit up to 20,000 people. It has 50 alters! It is the biggest Roman Catholic Church in the world and yet I didn’t feel a special Catholic connection when I walked in. Again, probably for the same reason that I did not feel anything special when I walked into the Sistine Chapel. Leaving St. Peter’s, we saw the Swiss guards, the Pope’s private security guards, guarding the gate to the Pope’s private quarters. We learned that the guards are actually from Switzerland and have to be Catholic. Back in the day, the Pope chose the Swiss to be his guards because they were neutral and the only ones he could trust! To this day the guards still wear funny looking jester-like outfits. While we were observing the stoic guards, a nun tried to go to the Pope's quarters and the guards would not let her in! Oops! 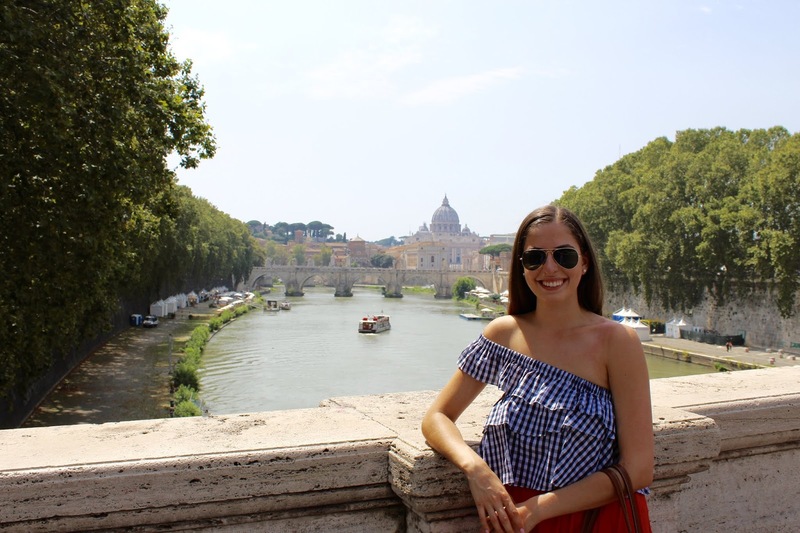 I wore a long cotton skirt from ASOS with a fabulous gingham crop top with a one-shoulder strap, also from ASOS, with a white sweater over my shoulders for the Sistine chapel and St. Peter’s Basilica! I felt so fabulous in this outfit! This outfit was definitely not the classic "tourist outfit." But if you haven't noticed, I am definitely not the classic tourist! This outfit was quite bold but I loved it! After our holy morning and tour, we had a free afternoon! 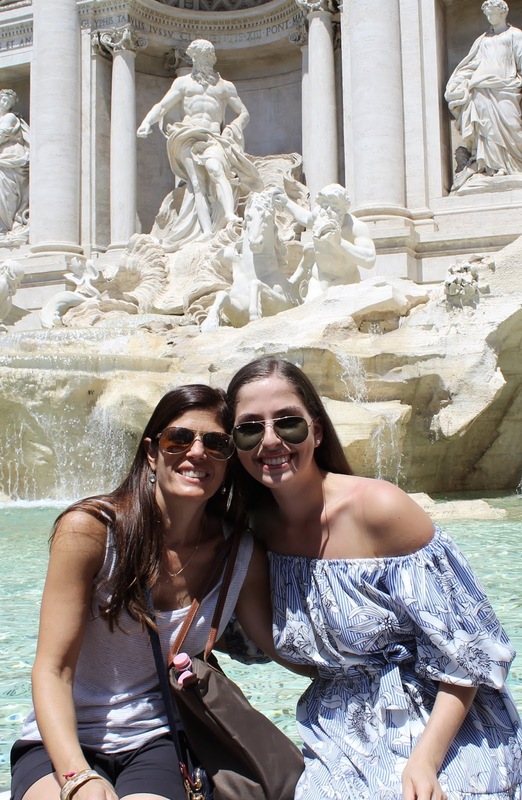 The ladies of the group and I decided to do a little walk around Rome to do some sight-seeing only after having our first pizza, of many at Piazza Navona, for lunch! On our walk, we got to see the castle in Rome and the other side of Vatican City, as well as the river and some of the pretty bridges that run over the Tiber River, which are very similar to the ones in Paris. We moseyed on back to our hotel, got a little lost on the way, another theme of the trip, getting lost, and my sister and I sat on the roof top terrace of our hotel, and did some reading and relaxing. I am proud to say that I did no email checking this vacay and focused on pure relaxation. Dinner was served at Colline Emiliane. The line for this restaurant was out the door, so good thing we made reservations that fit our party of 16, way in advance. Little did I know, but Colline Emiliane is a Michelin Star restaurant! It was amazing! It was the best meal we had in Rome! It was a far walk from our hotel, but it was worth it! On the walk we got to see the Trevi Fountain and the Pantheon, which we toured the following day. While walking home to our hotel, we could hear some chants and saw some fireworks, so we went to look and saw that a protest was going on right in front of the Pantheon. We were not sure what it was, because no one in our family speaks Italian very well, and it was a bit scary, so our New Yorker instincts kicked in and we decided to walk around the protest. I have to say that Rome has a very strong military presence at all major monuments, and I felt safe the whole trip. Even during the protest, I felt relatively safe. While we were walking around the protest, which we later found out was a birthday celebration for the Rome football team, we could see the army officers that were guarding the Pantheon, calling in backup. I felt very safe the whole time I was in Rome! There were no gypsies trying to pick-pocket you, like in Paris, and there were armed guards everywhere, also unlike in Paris. A group of 16 never leaves on time, even when we have important things to see like the Coliseum! The Coliseum was amazing considering how long ago it was built. It was big and cool to see, because it really was the center of Ancient Rome, but it was smaller than I expected. While waiting on another line for the Coliseum, there was a French couple behind me that didn’t understand what line they were in. The people behind them were trying to tell them in English, that they were in the wrong line, so I jumped in and was able to explain it to them en Français! I was so proud of myself that I was able to speak French on the whim like that! It was a big highlight of my day! After sweating our brains out at the Coliseum, some of us climbed the famous Spanish Steps, 135 of them separating the French church and the Spanish church. 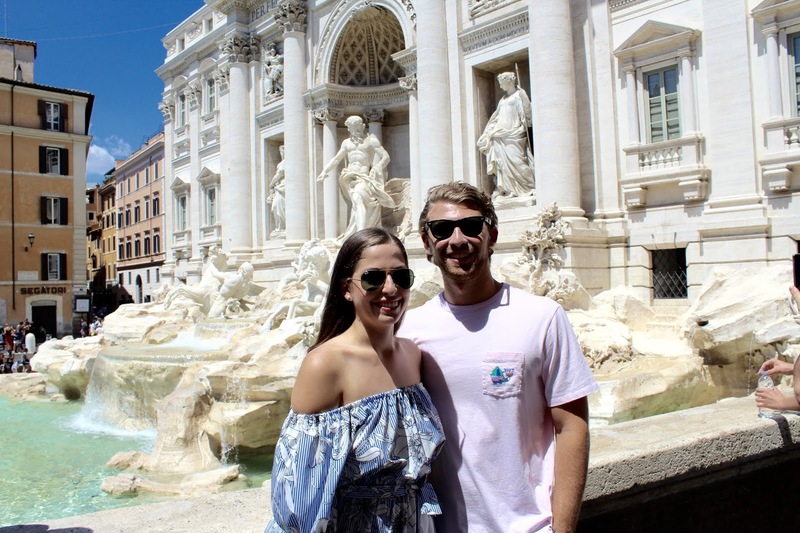 Still sweating, we made our way to the famous Trevi fountain and made a wish, just like Lizzie McGuire did! The Trevi fountain isn’t as big as it looks in pictures and was very very crowded. I was cool and comfy in my Zaful off the shoulder, knee length dress! Flowy dresses were my pick for the trip! Nothing tight, like shorts or pants! All dresses and skirts! While walking to our next stop, the Pantheon, which is the most well-kept ancient building in Rome, the elastic on my dress broke! So, while I was trying to not flash all of Rome in the Pantheon, while keeping my knees and shoulders covered, because it is a church after all, I got to see the perfect dome shaped church! The Pantheon is so cool because not only is it a perfect sphere, but in the ceiling, there is a circular opening, so when it rains, the rain just comes in at that spot, I’m sure it must be gorgeous. Our tour guide was also telling us that on the Pentecost, the fire department goes on top of the Pantheon and sprinkles red rose petals from the opening of the dome! I’m sure it is a beautiful sight! The Pantheon also has the first King and Queen of Italy buried there, as well as the artist Raphael! 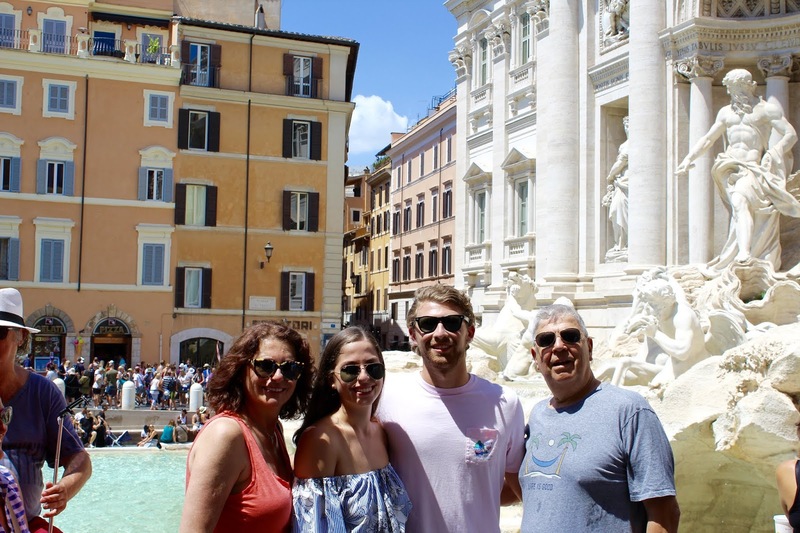 Continuing on our tour, we went to the Piazza Navona, which is right near our hotel and which used to be a stadium where Olympic Games were held! It has a gorgeous fountain now! We went to the same plaza the day before for our pizza lunch! After our tour, we went back to our hotel and changed for dinner. While waiting for everyone, my mom and I had some mommy and me time and treated ourselves to some rosé on the roof top terrace! We went to dinner at Grazia & Graziella, which was on the other side of the river. It was a nice walk to a very cute part of the city! It was a very casual restaurant, as they all are in Rome, and it was very welcoming to a large group like ours because the restaurant had a big back room! The only thing I didn’t like about the restaurant is that they saw we were Americans and handed us English menus, I was a little offended! For dinner, I opted for a classic, spaghetti and meatballs, and ate the entire thing! While walking home, the littlest one, Zoë, also my Goddaughter, decided to dance the night away to a live band that was outside of our restaurant! It is so funny that all the music in Italy is American music! Every restaurant we walked into had American music. Also, everyone spoke English, even all the cab drivers! We stopped for, shocker, more gelato, lemon for me, before we made our way to bed. It was our last night in Rome before hopping on a super-fast train to Florence. Check back tomorrow for the next Italy travel guide: Florence!